This post is not so much about this recipe specifically but a nod to another of my favorite cookbooks The Classic Pasta Cookbook by Giuliano Hazan. Slowly but surely I’m cooking my way through it in Julie &Julia style but without giving myself the pressure of doing it all in one year and with no whining. Cooking from this one is easy and satisfying. This will be the 47th of the 102 recipes that I’ve made from it to date. The book itself has a permanent home in the recipe stand on my kitchen counter, serving as a backbone of sorts to the myriad of things I’m planning to cook. I’m certain I purchased it because it was written by the son of the Marcella Hazan, the Julia Child of Italian cuisine. In the 80’s I had the great fortune to take a series of classes from Marcella at a small shop in Westlake Village CA. The shop has since grown into the Westlake Culinary School (Home of Let’s Get Cooking) so if you are one of my LA friends check it out!! They have hosted every one from Marcella to Julia, Wolfgang and Jacques to name drop a few. The next section of the book has a tutorial on the equipment used to make home-made pasta, step-by-step instructions on making the dough, rolling the pasta, cutting the pasta, stuffing pasta and ends with cooking and serving tips. Then come the recipes First a section on Classic Sauces. 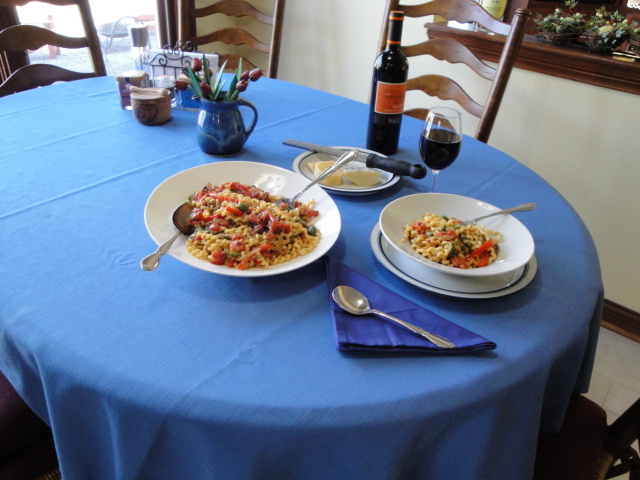 There are eleven in all, each one with a beautiful photo of the finished dish as well as an array of the ingredients and picture of pastas that pair best with the sauce. Needless to say all of them have been prepared in my kitchen on multiple occasions. My daughter’s specialty was the All’Alfredo, with only 7 ingredients including the pasta and salt & pepper, it was a great starter recipe. Not only did she master it, but she feed and taught several friends how to make it as well. 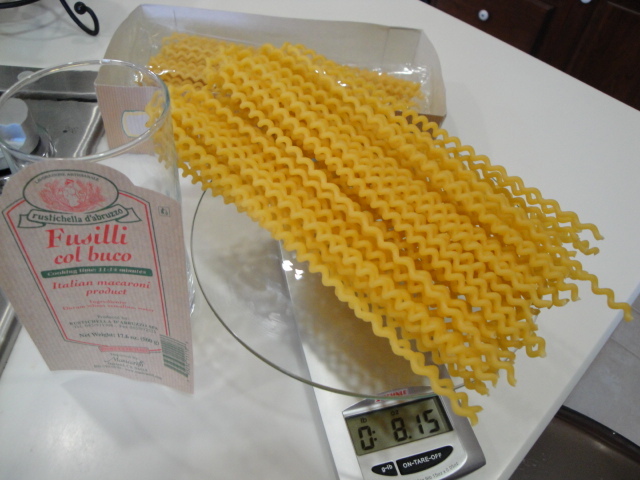 Next come recipes organized by pasta shape-long, ribbons, tubes, special shapes, soups and stuffed and baked! These are the one’s I’m still cooking my way through – 35 down and 55 to go. It doesn’t end there however. 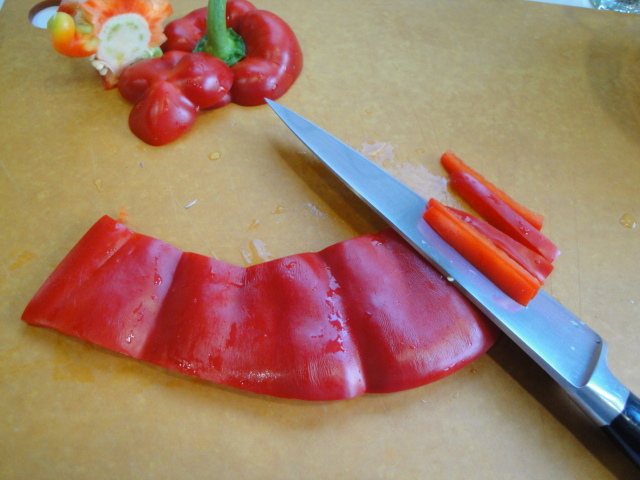 There is also a section on preparing vegetables-photos of classic techniques for dicing and chopping and a great tip on how to peel a tomato/pepper or any soft fleshed fruit or vegetable. This last tip is one that his mom taught in those classes I took and that I continue to pass on to those I teach. Not quite ready to move to video in this blog, but I think you’ll get the gist of it in a still shot when I’m using fresh tomatoes some day soon. Not today, however-canned diced are the ticket for almost all recipes in early April. 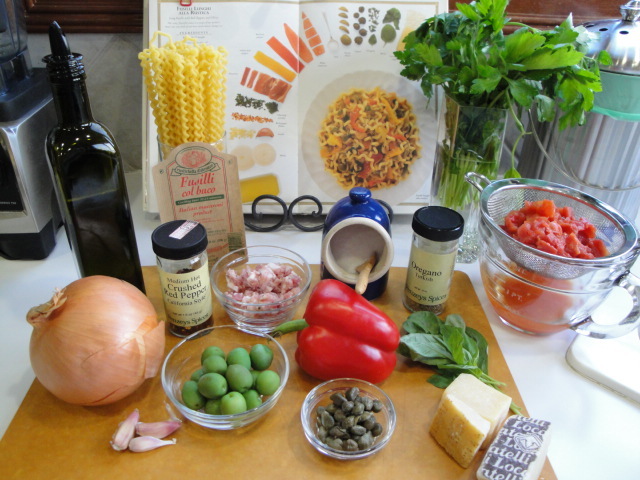 Last but certainly not least there is a section on the Italian Pantry followed by Notes with little gems of knowledge ranging from the meaning of molto al dente to why vegetable oil is sometimes preferred over olive oil in a recipe. Wow! I didn’t start this post as a sales pitch for this cookbook, but I do love it. Sadly it is no longer in print, but available through guess who. In any case, if you ever run across one at a garage sale, thrift store or in a box on a street curb in Brooklyn grab it. This particular recipe fulfills my reducetarian goals with just a bit of pancetta for flavor. It could be completely vegetarian, but that little bit of pork goes a long way when it comes to flavor. 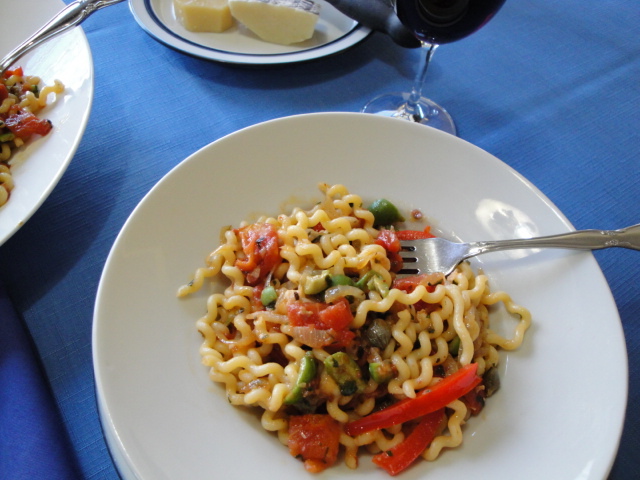 It does goes a bit out of season with the bell peppers but as with the tomatoes last week I’m craving fresh produce and when I found the lovely fusilli lunghi at the store yesterday I couldn’t resist. As for the basil, dried is not a good substitute for fresh and I’m all out of my frozen stash from last summer’s garden-sooo. Yes, that’s the original recipe in the stand on my counter with all of the ingredients I’ll be using to make this dish. 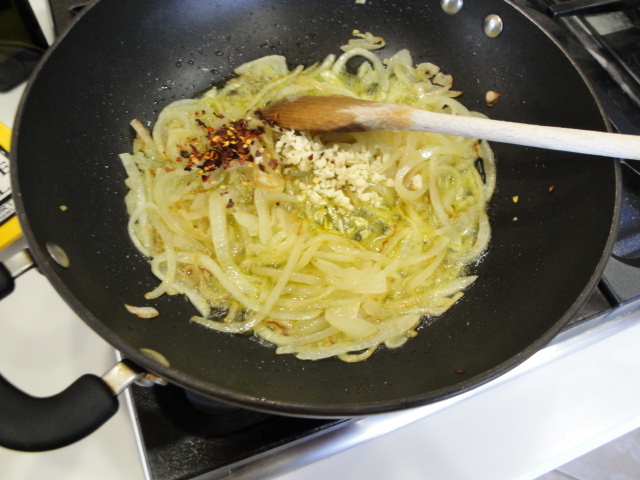 In the original the ingredients are shown in an array according to their inclusion in the recipe and in the form (minced, strips) to be used in your mise en place. 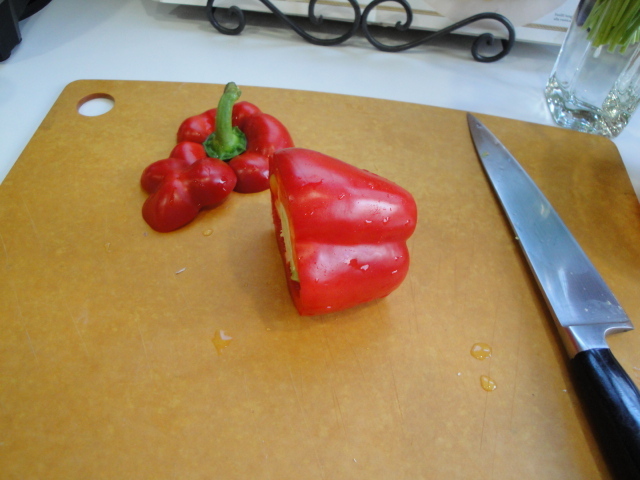 Next the pepper. 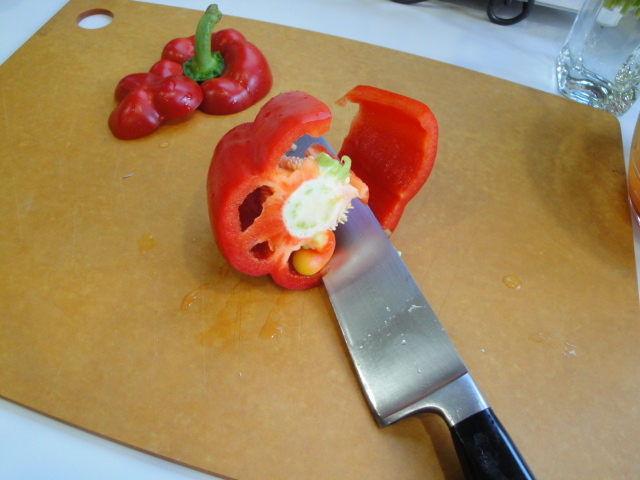 There are many ways of getting that pepper cut into uniform strips but this is my favorite. Then I get too munch on the top and bottom while I’m working. I took a short cut with the pancetta (actually I was using up some from a previous recipe) and used pre-diced. 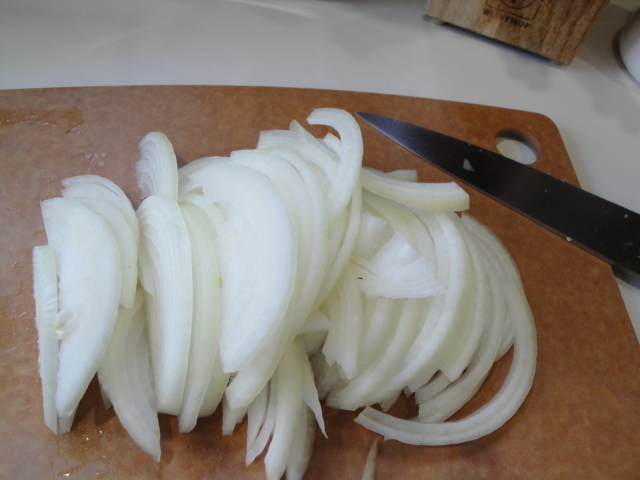 To be true to the recipe buy a 1/4 in slice and cut it into thin strips. 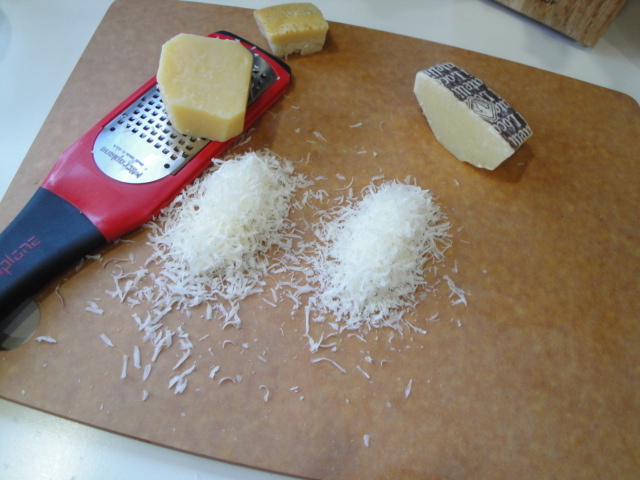 If you don’t have both parmigiano-reggiano and pecorino romano in refrigerator, stick with the parm. 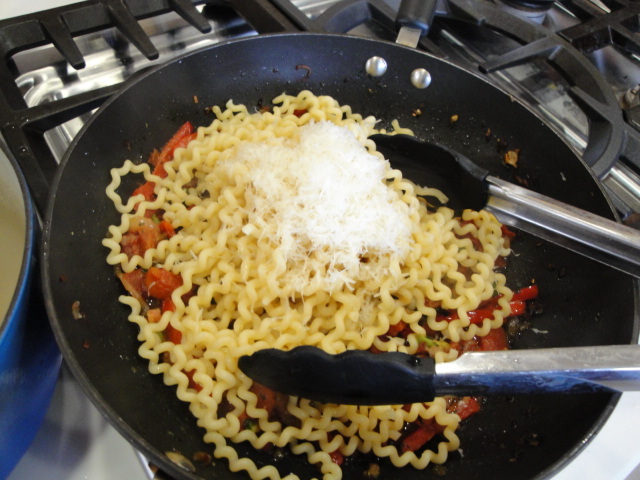 Much better to have a good quality parmesan (no pre-grated please and don’t even ask about substituting with the stuff in the green canister). The pecorino has a stronger, sharper flavor but I doubt that in this dish you will miss it. Now that nearly all of your mise en place is done you can start cooking. Into the pan with the olive oil. 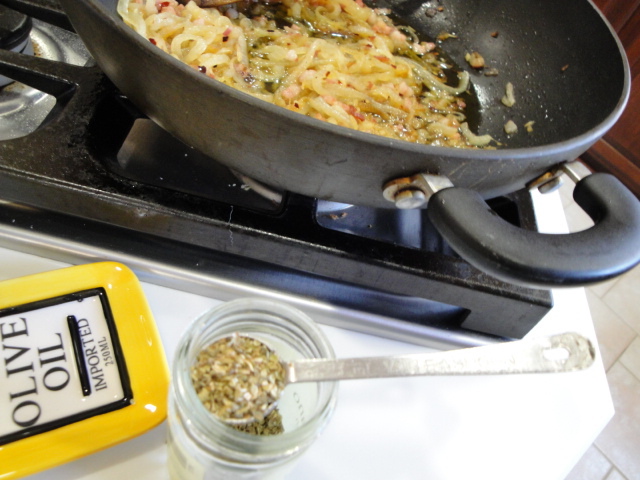 I find my wok skillet ideal for cooking Italian pasta sauces like this one. If you don’t have a wok, a large skillet is the next best thing. 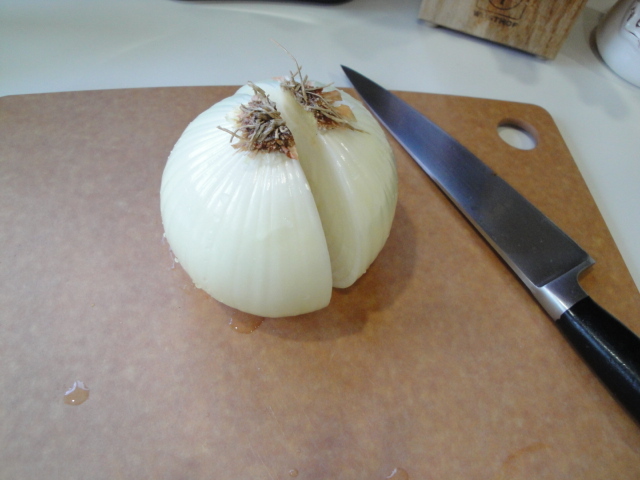 Now it’s low and slow until the onions are soft and a rich golden color. 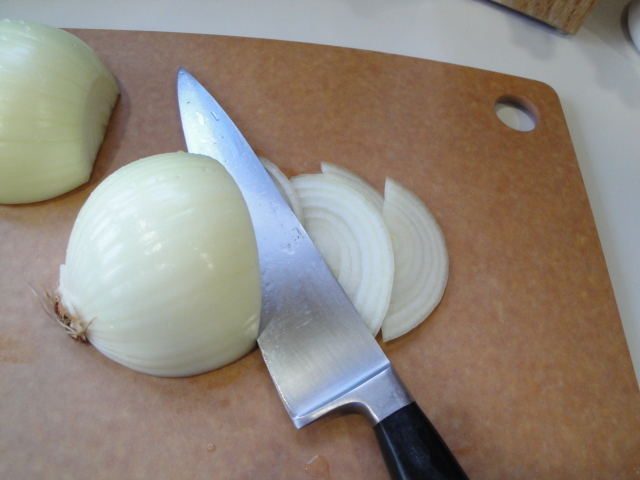 This brings out all the natural sweetness in the onions and makes the flavor mellow. Now in with the garlic and red pepper flakes. 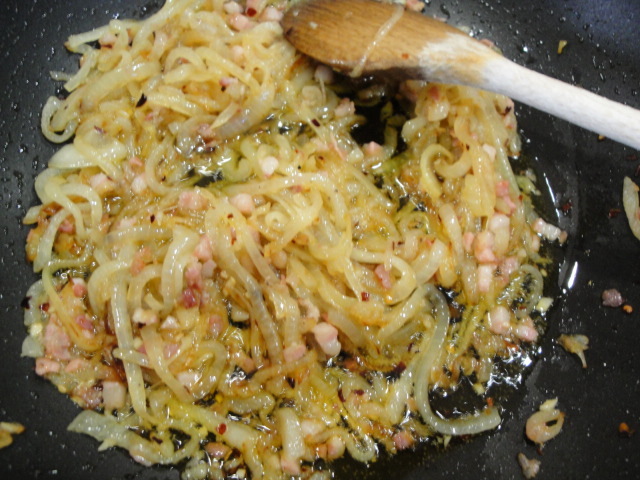 As soon as you get them stirred in, its time to add the pancetta. 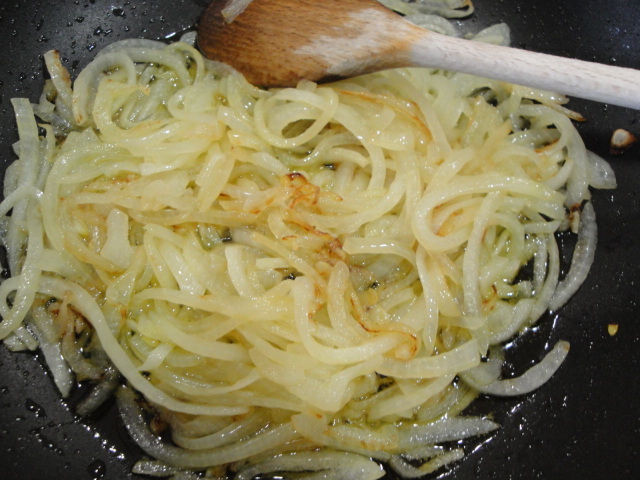 Cook and stir frequently until it’s lightly browned but not crisp. At this point it’s time to start heating the water to cook the pasta. Note I have the salt ready and waiting. 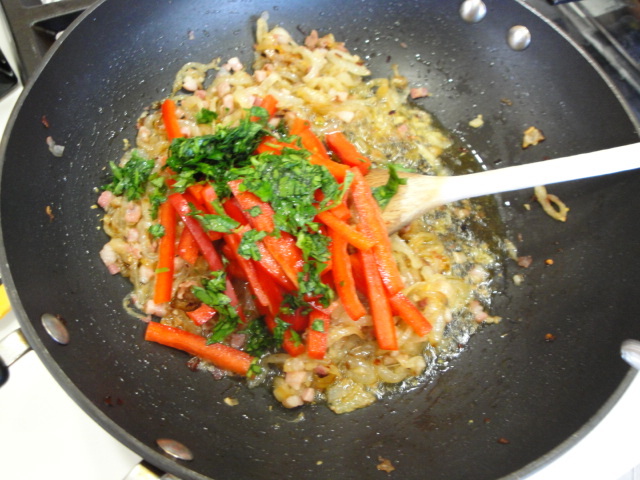 Back to the sauce – it’s in with the pepper strips and parsley. These need to cook until the peppers are tender. It should take around 5 minutes. Once the peppers are tender, add the tomatoes and oregano if you’re using dried. If you are using fresh tomatoes they will need to cook for another 5 minutes or so. If you are using canned all you need to do is stir them in and let them get warm. 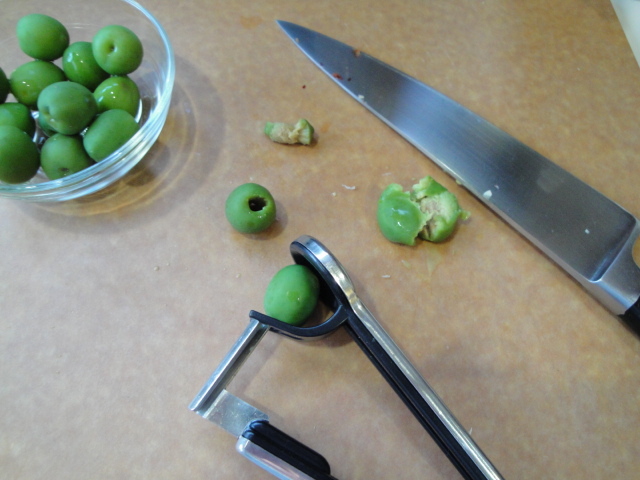 Next the olives, capers and basil (fresh oregano if this was your choice). 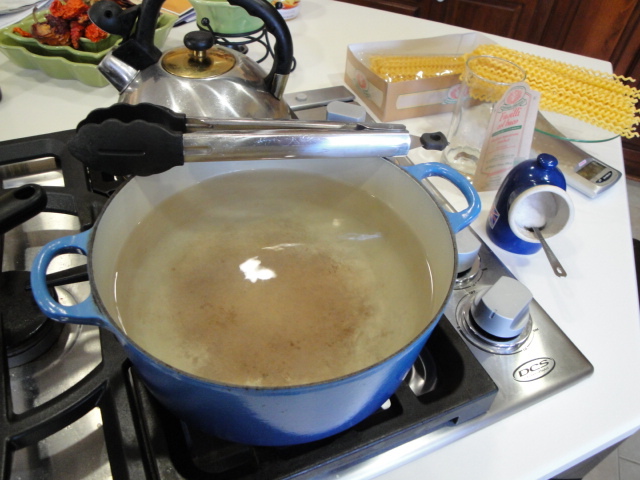 Stir to combine and then turn off the burner or remove from heat source if your cooking on an electric range. 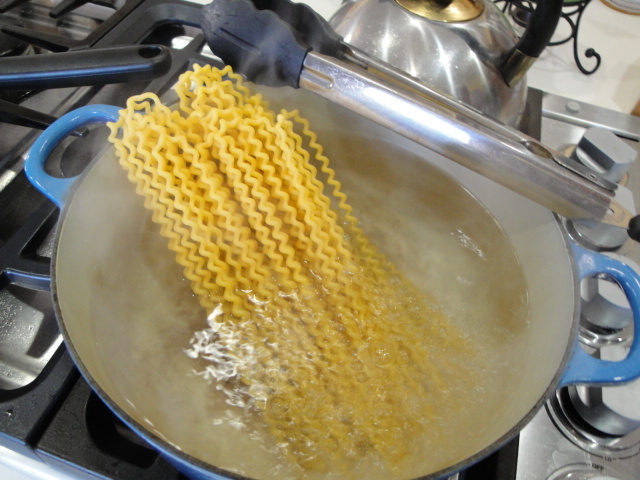 Add that Tablespoon of salt to your boiling pasta water. So here’s the deal-the only thing I now always change when using this book is to cut the amount of dry pasta in half. I know, I know, we Americans over sauce our pasta, but even with half the dry weight of pasta, these recipes are never dripping or covered in sauce and actually turn out looking pretty much as pictured. So I leave it to you to decide! In any case I almost always weigh my pasta. Drop it all into the salted boiling water and give it a good stir to separate the strands. I set my timer for a minute or two before the package directions indicate so I can check to see how close to that al dente I am. 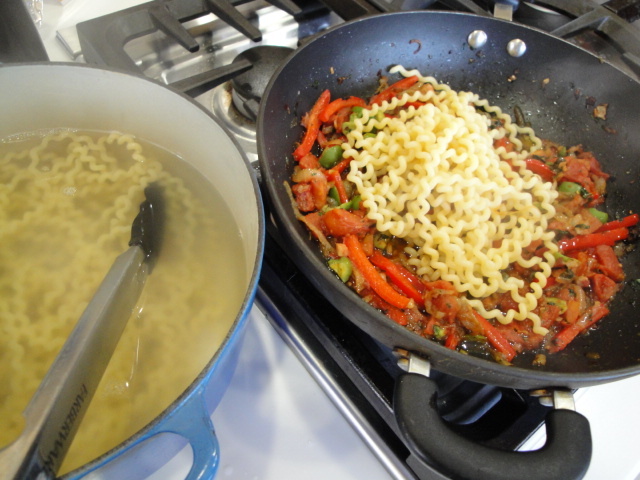 Once I hit al dente, I move the pasta pot to the sauce and transfer the noodles to the sauce with a pair of tongs. No pasta water facial from taking this big pot of hot water and trying to pour it into a colander! Then if I need some of that nice starchy water to thin the sauce a bit, it’s ready and waiting. But best of all no extra dishes (colander and bowl to catch pasta water) to wash!!! Add the cheeses. Toss it all together and your ready to eat! It’s a vegetable pasta, but the flavor of this one needs a light red wine. My hubby chose a Sangiovese Di Romagna! 1 lb. fresh ripe plum tomatoes peeled, seeded and cut into ½ inch dice or 1-14.5 oz. 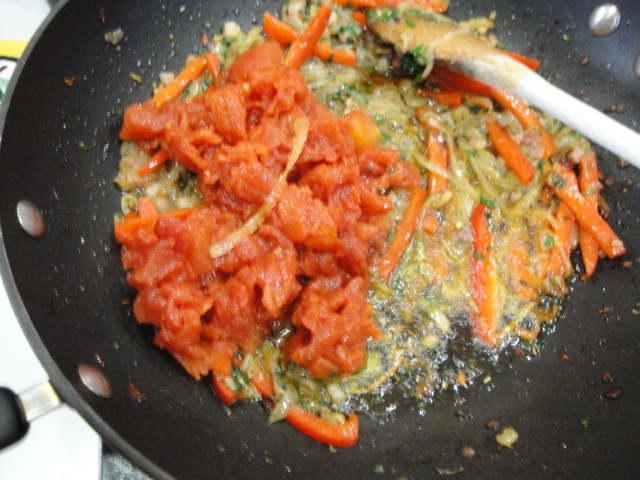 can diced tomatoes drained – see comment about adding dried oregano here. If you’re like us you will want to take an additional piece of cheese to the table for grating on top. 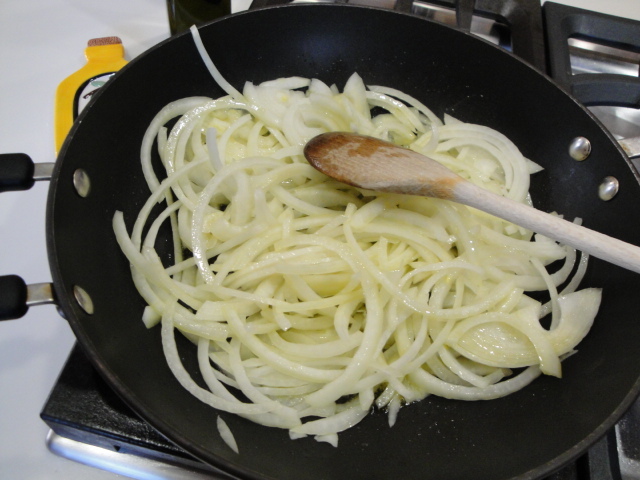 Put the olive oil and onion into a large skillet over medium-low heat and cook until the onion has softened and turned a rich golden color. 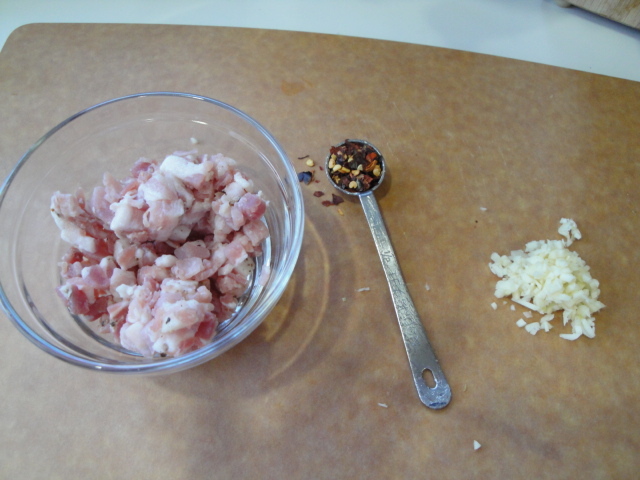 Increase heat to medium-high and stir in the garlic, red pepper flakes. Sauté for 30 seconds or less. 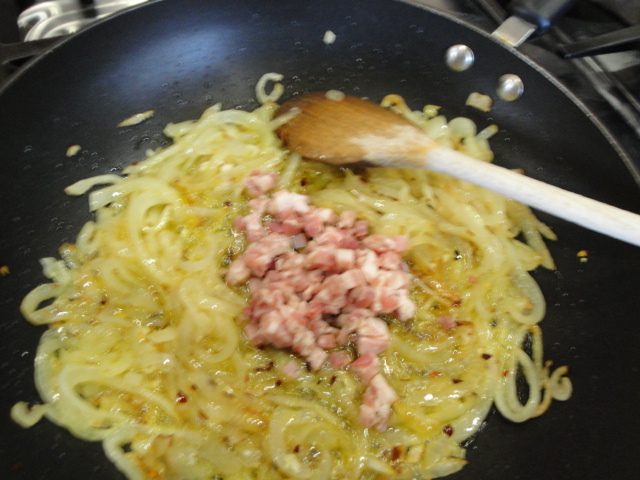 Add the pancetta and cook until it is lightly browned but not crisp. 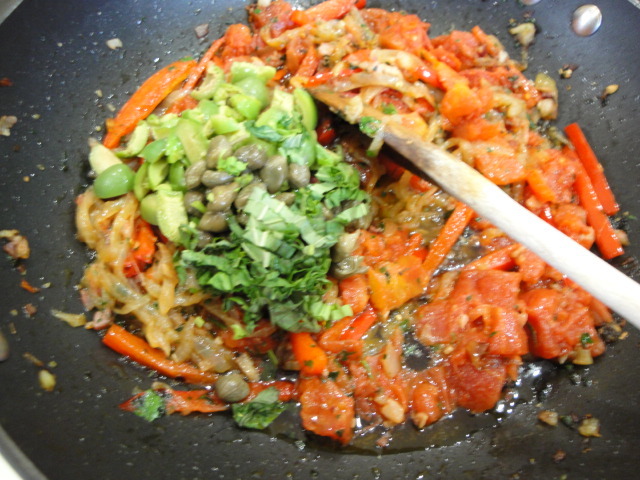 Add the bell pepper and parsley and cook, stirring occasionally until tender. Add the tomatoes (and the oregano if using dried) and cook another 5 to 6 minutes. 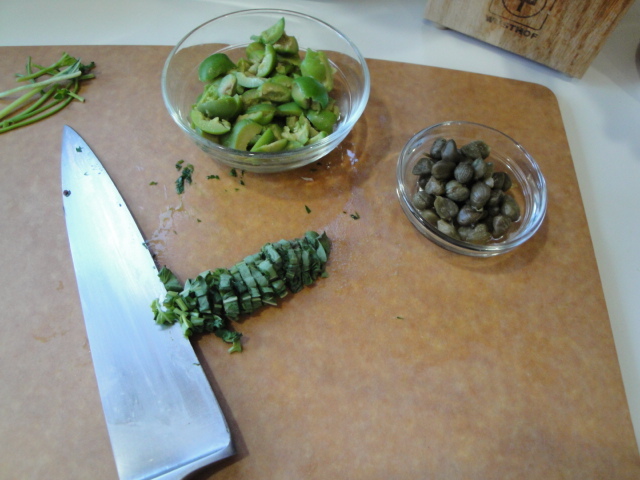 Stir in the olives, capers, oregano (if using fresh) and basil and remove from heat. 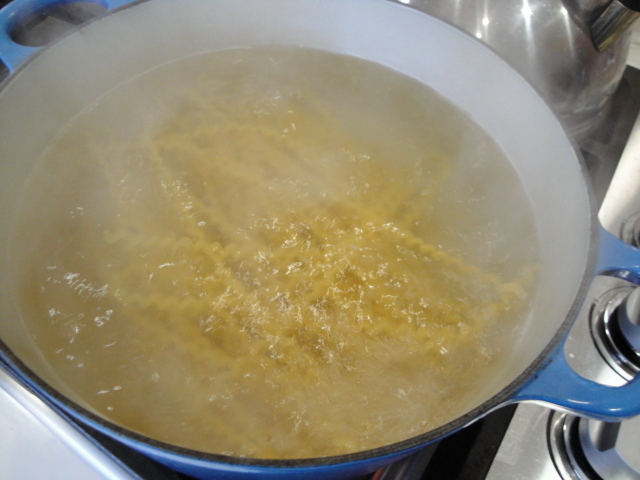 When the pasta water is boiling, add 1 Tbs. salt and drop in the pasta all at once, stirring until the strands are submerged and separated from each other. When the pasta is cooked al dente (taste a strand about a minute before the package directions indicate it should be done). Drain it or lift from the water with tongs and toss it with the sauce and the grated cheeses. Taste for salt and serve at once with a light red wine.